Nobody understands the importance and value of the load you haul better than us. And you will soon understand the motto “Towing Peace of Mind” by using this innovative, award winning product. By using this ball mount correctly, trailer say will be prevented protecting your load, your vehicle, ánd your family. Why buy a Weigh Safe product and not one of the many others that are out there? 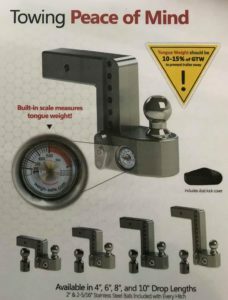 First of all, each Weigh Safe ball mount has a built in hydraulic scale engineered to measure tongue weight. This scale is designed to be accurate to within 50 lbs and carries a Weigh Safe guarantee. This scale will allow you to both easily and quickly ensure that your tongue weight stays within 10-15% of your gross trailer weight reducing liability while maximizing efficiency. Second of all, with components made of 6061 T6 Aircraft Grade Aluminum and 303 Stainless Steel, you won’t find a better engineered ball mount on the market. We are the authorized dealer in Floral City and vicinity, so feel free to visit us during business hours and take a look at this amazing product yourself. No time for a visit? Go online and check out the website Weigh-Safe.com to see all the options you can choose from. 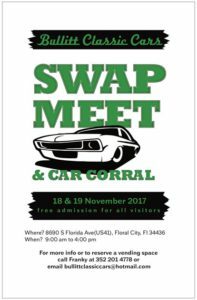 Saturday, November 18th and Sunday, November 19th, Bullitt Classic Cars will be hosting its first annual Swap Meet & Car Corral in Floral City. Admission to all visitors is free, and if you have a nice ride you want to show to other visitors, feel free to bring it! There is no cut-off year on vehicles, but it has to be something special. Vendors are welcome to give us a call to reserve a spot. There will also be food, and drinks available at very reasonable prices. 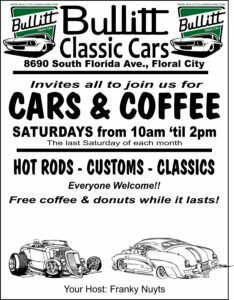 Every last Saturday of the month, Bullitt Classic Cars hosts an event called Cars & Coffee. We interviewed the owner, Franky Nuyts, and talked to him about this monthly event. 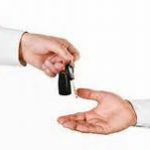 Consignment is the act of consigning, the act of giving over to another person or agent’s charge, custody or care any material or goods but retaining legal ownership until the material or goods are sold. That may be done for the purpose of shipping the goods, transferring the goods to auction or intending the goods to be placed on sale in a store (a consignment store). I’m Geoffrey and I want to tell you the story of my incredible search for my ’51 Chevrolet Fleetline. My name is Geoffrey, I live in Belgium and I have been driving my 1966 fastback since 2000. Yes, I said “been driving”, because I love to get behind the wheel. My nickname is Mustangdriver and my website is mustangdrivers.be. 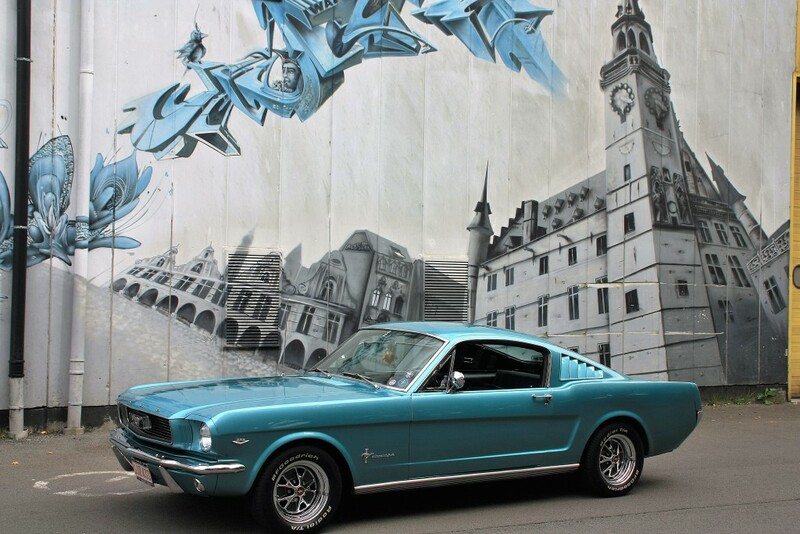 This month’s feature is the Mustang 2005 GT, owned by Peter Proost. We asked Peter what drove him on choosing this beautiful car and why he decided to give it a complete makeover.